In 1920s Melbourne, an emancipated sleuth solves a murder at a woman’s magazine and rescues her shanghaied lover. As Rosebud Peachblossom, Marcella Lavender wrote and illustrated books for children and did similar work for the magazine Women’s Choice. But her personality was far from winsome, and now her maid Mercy has found her stiffening at the breakfast table. Police inspector Jack Robinson again solicits the help of elegant investigator Phryne Fisher, who goes undercover at the magazine, inheriting much of Miss Lavender’s workload, in order to focuses on her coworkers, a colorful group untouched by grief. The field of suspects widens when Phryne finds a host of angry letters to Artemis, under which sobriquet Miss Lavender wrote an advice column. She takes gossipy Miss Prout to lunch at the Adventuress Club to pump her for information about her colleagues. Meanwhile, Phryne’s lover Lin Chung hasn’t returned from a Chinese silk-buying trip or contacted her. His disapproving family offers neither help nor support, even after she learns he’s been kidnapped. 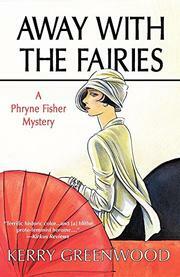 Phryne undertakes a daring maritime rescue before returning to Women’s Choice to expose the killer. Greenwood (Murder at Montparnasse, not reviewed, etc.) crafts a passable whodunit, but terrific historic color (complete with a three-page bibliography) and the blithe proto-feminist heroine are the real highlights here.